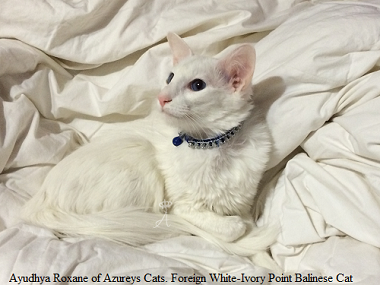 Ayudhya Roxane of Azureys, W67 Foreign White-Ivory Point Balinese, Genetically Seal pointed. FiFe registered. 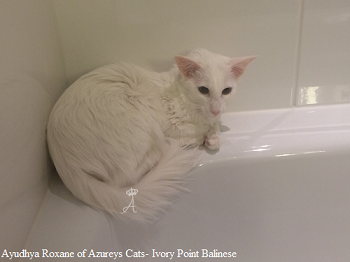 Roxane is a very, very rare Foreign White (W67) Balinese cat imported from Europe in December 2014. She is such a sweet and talkative cat. She enjoys her feline family, but always prefers to be with her humans as she calls on us to be petted and is very much a lap cat. One specific trait we love about her is that she loves to sleep under our bed sheets. 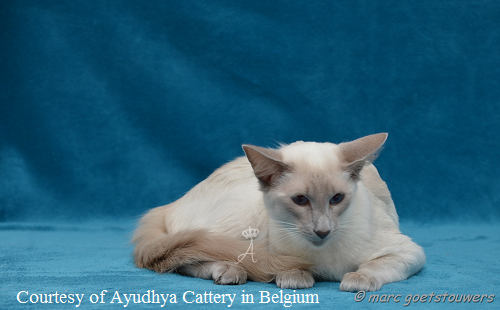 She was born in Brussels under the care of her previous breeder and owner Carrie Jacobs from Ayudhya Cattery in Belgium. 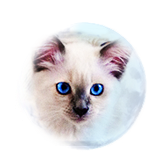 Carrie has worked hard improving and preserving the Balinese cat breed which is not as common as the Siamese or Oriental in Europe. She has done this for the longest time with her friend and breeding program partner, Corrine Michaux who is a judge for the Centrale feline belge (CFB) and Livre Officiel des Origines Felines (LOOF) in Europe. 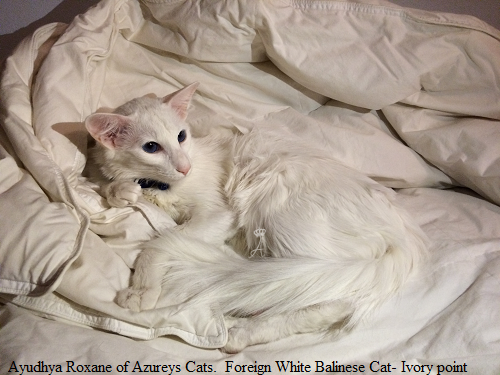 Foreign White Balinese cats are rarer than their Siamese counterparts which makes Roxane very special. 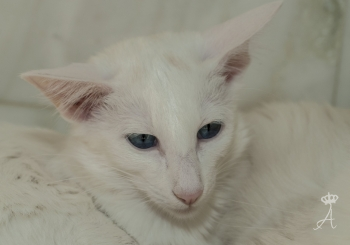 It took us quite a long time to identify, and find such a great specimen for the start of our Foreign White (W67), Ivory Pointed Balinese cat breeding program as it is difficult to find true White Siamese or White Balinese cats due to many factors. 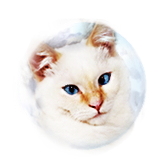 For one, breeders in Europe and in America breed White Oriental cats with blue eyes that are not the true foreign white Siamese-Balinese. 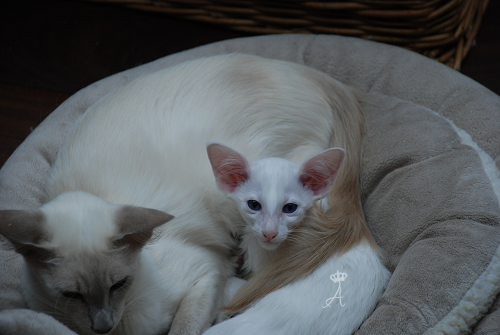 These cats are classified and registered as White Orientals (W61) due to their lineage depending on the registry and are often confused and falsely represented as Foreign White, vice-versa. Many of those lines cannot be identified or confirmed due to being mixed into the Oriental cat breed classification. 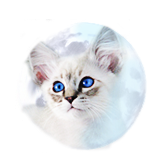 These cat registries also misrepresent the true Foreign White Balinese by registering them as Orientals, even when they might be true white Siamese-Balinese and should be registered as such. The only way to distinguish the difference is by having the cats DNA tested. 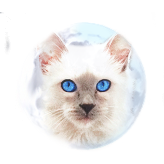 Secondly, for the above reasons European breeders with true and actual Foreign White Siamese-Balinese cats have become selective in who gets their breeding lines due to being afraid their lines would become mixed in with Orientals and in irresponsible breeders not maintaining them pure. 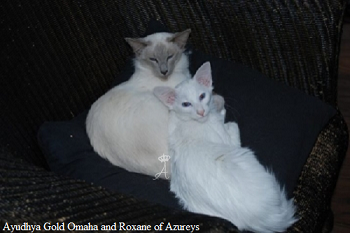 Roxane is a true Foreign White Balinese cat. 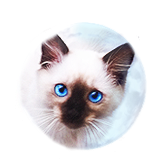 She is registered coded as W67 which is the registration classification code for a true White Siamese-Balinese cat in Europe. 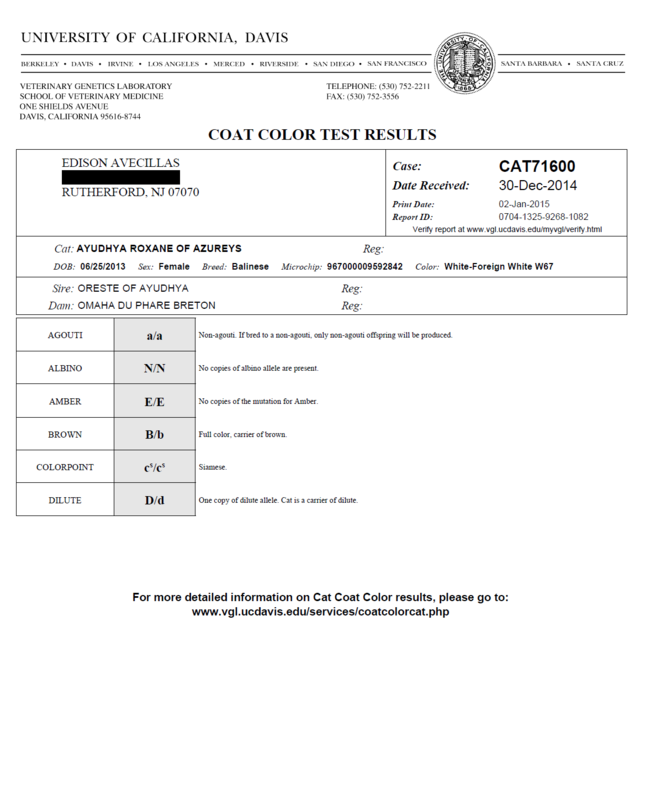 She was also DNA tested through UC Davis genetics laboratory (see below) which reflects the cs/cs genetic marker that has provided confirmation that she is a true Siamese-Balinese cat. This same DNA test also revealed that she is genetically a Seal point Balinese. 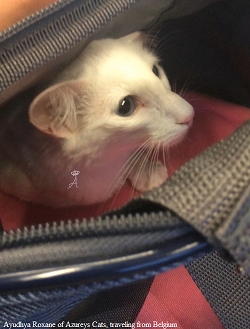 By confirming that she has a color point "within" the white coat, it gives an additional confirmation she is a true white Balinese cat and not a dominant white cat with Siamese/Balinese lines (Oriental). Being that American cat registries at this time misrepresent and register the true Foreign White Siamese-Balinese as an Oriental Cat, Roxane and all our future Foreign White kittens will only be registered with FIFE in Europe, to maintain the correct and pure registration of our Foreign White-Ivory point Balinese cat lines. 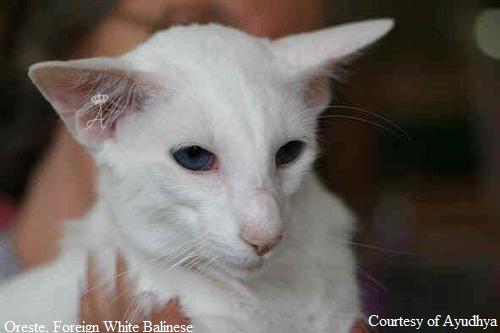 For more information on the true Foreign White Siamese and Foreign White Balinese (W67) cat and its genetics please visit our Rare points section. Thank you Carrie and Corrine for allowing Roxane to come from so far to live with us and for choosing us to preserve your Foreign white- Ivory point breeding lines, it is a blessing from God. Update 12/2018: Roxane has been retired at this time. She will be dearly missed as she was one of the most important cats brought in to our breeding program in our goal to produce and preserve the very rare Foreign White, Ivory point breeding lines. Her legacy and breeding lines will continue in the offpsring she produced and those continuing the work in preserving this rare and beautiful color.